I did not know much about handmade jewelry until I developed an interest in it. This interest grew and became a passion. Now 5 years down the road, I must say it has been a pleasant as well as a challenging path! My interest actually started from seeing beautiful beads in different colours and shapes strung into necklaces and bracelets. I loved the colours and the combinations- the ease at which you can wear them and look lovely. I discovered the other types of handmade jewelry and became amazed at what these hands could do! Handmade jewelries are unique and one-of-a-kind. This is due to the fact they are not mass produced. Each piece (be it an earring, necklace, bracelet, ring or brooch) are created with hands from the beginning to the end. This takes time, energy, creativity and passion. Due to the creativity behind each design, it’s rare to see the exact design from another jeweler except the design is copied or duplicated on the request of the customer. Even when the design is copied by another, it’s still very difficult to be seen everywhere. Every handmade jewelry is unique and never the same. That’s the beauty in creativity….in handmade jewelry. Have you ever looked and admired those high-end jewelries and wished you could afford them? Well, if you cannot, you can definitely afford handmade jewelry. They are equally exclusive but far less expensive when compared to those high-end ones. The designs of handmade jewelry can be altered and customized to your needs. It can be designed for YOU! 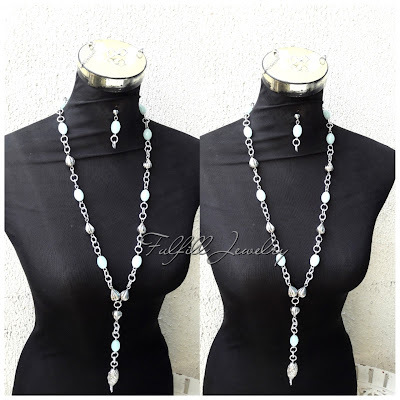 For that birthday dress, wedding occasion, dinner wear… You pick what you want and how you want it, this can be brought to life, to become a very beautiful and stunning piece of jewelry you could cherish for a long time. Handmade jewelries can stand the test of time. For instance, gold-filled jewelries (I wrote about the meaning of gold-filled jewelries in my earlier post) could last for years without tarnishing if used and handled properly. Handmade jewelry can be re-designed, re-stringed based on your needs. This is simple because you can have access to the jeweler unlike some jewelry where you cannot contact the jeweler directly or worse, you do not know the jewelry designer! The jewelry is not likely to be handmade hence may not be duplicated if the quantity demanded is very small or if the machine is no longer available or even when the design is considered as ‘old’. Thereby a ‘new’ design has replaced the ‘old’ one. The cost involved in these processes may be huge not to mention the time and energy involved. This you would not experience with handmade jewelry since you can always contact the jeweler directly or through your retailer. Did I also mention the personality that can be reflected in jewelry design? Yes, it’s possible to express yourself, your personality. For those who are loud, they can get it really big, am-in-your-face kind of design. For the reserved, there are designs for you. Remember your personality is all about YOU. You can have beauty, uniqueness, personality and value for money with your handmade jewelry. Try them today for those of you that overlook them and experience the art, creativity and love connected to this special kind of jewelry. Check out my designs and pick for yourself and loved ones. I would love to hear from you. Thank you so much.